Painful and unpleasant-looking commonly describe the fever blister known as cold sores. These infections can appear on the mouth, lips, fingers, cheeks, and nose and are highly contagious in the early stages. Cold sore treatment can vary from home remedies to medication. From the time of outbreak, it can last from seven to 10 days and change conditions as it dries and cracks, causing pus to ooze before new skin grows. Other than a nuisance, and causing pain, a cold sore is usually not a serious health concern unless you have a depressed immune system. Cold sores are caused by the herpes simplex virus, or HSV. Of the two types, type 1 and type 2, the common cold sore cause is type 1. Once it first appears, the virus enters nerve cells and settles in a group of cells, called ganglion. It remains there in a dormant state until it is triggered once again to the surface of the skin. As it is contagious, the oral virus can be spread by kissing, direct contact with the sore or shedding skin, and infected saliva. This latter transmission is the reason someone with no visible sores can spread the virus to another person. Normally, when the sore appears like a blister, it is at the most contagious stage as once it dries, the chances of spreading are less. It should be noted that despite the old wives’ tale, a cold sore cannot be spread with the use of contaminated towels or surfaces. There are three stages to a cold sore and a range of symptoms can accompany the virus, especially for the first outbreak. Those experiencing their first cold sore initially report, sore throat, painful gums, headaches, swollen lymph nodes, or muscle pain. The first stage before physical signs of a cold sore usually involves a tingling sensation of the affected area. You may feel a slight burning or itch around the outside of your mouth or on your lips. The second stage is the appearance of red or white blisters along your mouth line. You may also have a fluid-filled blister near or on your nose or cheeks. The third, and most painful, stage is the blister burst, where the infected pus will ooze before a hardening crust forms over the open sore. Depending on whether this is the first cold sore, the stages can last for several days with complete healing taking up to four weeks. For a first-time outbreak, the symptoms that accompany the virus may require medical attention as any difficulty in eating and drinking can lead to dehydration. This is very serious as most attacks occur in children. If you are having a reoccurrence of cold sores, there are several things you can do to lessen the duration and pain associated with the virus as well as prevent more from occurring. Try the following cold sores natural remedies recommended by Dr. Axe. Keeping your immune system functioning properly will go a long way in fighting the virus. Eat probiotic foods such as yogurt, sauerkraut, apple cider vinegar, kimchi, natto, and lots of vegetables. Supplement your diet with vitamin E to help with the discomfort and pain as it soothes the skin. Vitamin E is also known to reduce inflammation and repair skin damage. You can take capsules or increase your intake of spinach, sweet potatoes, almonds, sunflower seeds, olive oil, and avocadoes. Capsules and enriched foods such as oranges, kale, broccoli, red and green peppers, kiwi, and grapefruit added to your diet will help fight the virus as well. Vitamin C can also heal cold sores as it promotes skin health and boosts the immune system. Increasing the zinc in your body will not only boost the immune system, but it will also decrease inflammation. The Alternative Therapies for Health and Medicine published a study showing zinc oxide/glycine cream aids in the healing process of cold sores. Zinc can be found in various forms, including foods such as chickpeas, pumpkin seeds, mushrooms, yogurt, turkey, eggs, salmon, cashews, and grass-fed beef. Take 1,000 milligrams three times a day to halt the cold sore process. This amino acid can also be found in legumes, poultry, fish, and vegetables. Avoid direct sunlight and sunburns to prevent a reoccurrence. Don’t forget to use lip sunscreen as well and opt for a non-toxic sunscreen. Choose a natural and organic brand. Comprised of antioxidant vitamins, minerals, enzymes, fatty acids, and hormones, aloe vera has many health benefits including speeding the healing process of cold sores. It also soothes painful areas. This natural essence helps to heal with its antiviral components. Phytomedicine published a study using peppermint oil against both types of the virus, with results showing it was highly effective in the early stages. The anti-inflammatory make-up of vanilla oil or extract can help to speed up the healing process as well as ease the pain. Apply vanilla extract, (the kind you cook with) to the sore four times a day until fully healed. You can also use vanilla oil or make your own with vanilla beans and alcohol. Used to prevent and fight colds, echinacea tea can ease pain, boost your immune system, and reduce inflammation. Replacing your toothbrush may prevent a regular reoccurrence of the cold sore. During the contagious stage, it is best not to touch the affected area with your hands. Use cotton swabs to apply any ointment or oil. 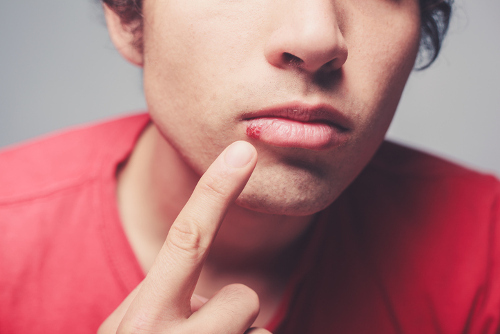 Use a cold compress or ice on the cold sore to slow down the blood flow and reduce inflammation. It will also help ease the pain. Although the reoccurrence of cold sores usually cannot be prevented completely, the same measures taken to rid yourself of the inflammation can also be used to deter them from popping up in the first place. If you experience cold sores on a regular basis, talk to your doctor about an antiviral medication. Apply sunscreen to the area usually affected if you find sunlight is a trigger for sores. You can help yourself, and others, by avoiding skin contact during the contagious stage. When the blisters are present, it is also best to refrain from sharing cups, utensils, and lip balm. Another key tip is to wash your hands often. Whether you first experience a cold sore during childhood or adulthood, it is good to keep in mind it is a temporary, non-serious health issue. These painful little blisters take several days to heal with an expected full recovery within four weeks. You can follow several at-home remedies to aid in the healing process and prevent reoccurrences. Remember to seek medical advice if you have any questions or concerns about cold sores that return frequently or do not heal.